It means ‘good little diver’ which is apt as not only are little penguins the smallest penguin species, they can also dive down to depths of 60 meters in pursuit of prey. Having a dark back and light underbelly is known as counter shading. The dark coloured back is to help the penguin blend into the sea so it cannot be seen by predators (such as birds of prey) from above whilst it’s silver-white underside mimics surface reflection to conceal itself from predators swimming below (sharks and seals) as well as prey. The little penguin diet consists mostly of small school fish, krill or squid which are caught with beak jabs as the penguin swims and swallowed whole. This hunting method is further aided by a series of tiny barbs on the roof of the penguin’s mouth. The famous penguin parade that draws hundreds of thousands of tourists to a windswept beach on Phillip Island at dusk every year is actually a survival tactic designed to confuse and overwhelm predators like sea eagles, gulls and ravens. Most penguin colonies fish by day and return to their burrows in groups around dusk. They gather beyond the break line in the ocean where they can often be heard calling to one another before coming ashore in a flock. At the Phillip Island penguin parade, researchers consistently count between three and four thousand penguins coming ashore each night. To attract a mate and seal a bond between a couple, the penguins perform a song and dance routine either solo or as a duet using a combination of a bass rumble and a trumpeting cry. 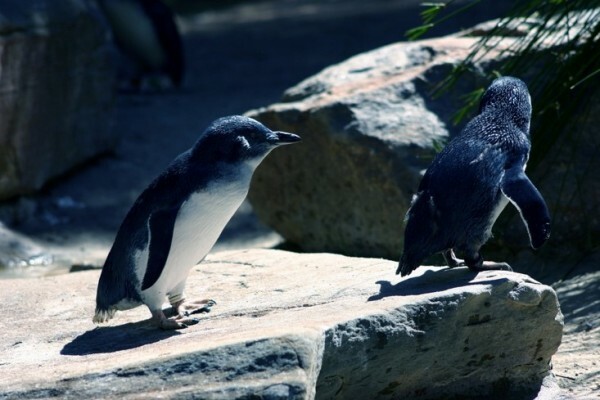 Little penguin dance moves include beak, flipper and body movements. Melbourne on the Move runs three different day trip options from Melbourne to Phillip Island to see the little penguins. To learn more about our Melbourne bus tour options, check out our day trips page or call us on 1300 55 86 86.